Good ice cream is a spectacular thing for sure. Ice cream is so simple and delicious! We’ve had an ice cream maker for 3 years now but have probably only made homemade ice cream a handful of times, which is sad. Very rarely was it worth the effort anyway. A lot of the time we used low-fat milk and half-and-half, which cuts calories but also ruins the texture. Also, we’ve had a chronic problem in the past of eating too much of the ice cream straight from the freezer bowl while it’s still soft-serve and melty, and then having virtually none to eat properly frozen later on (oops). We decided at the beginning of the summer that we would make a decent amount of homemade ice cream/sorbet/frozen yogurt, and do it right! This was our inaugural batch- dulce de leche ice cream. It certainly is fantastic! Thanks to the large amount of creamy dulce de leche in the ice cream itself, there’s no need for egg yolks! This was a major plus for us, since egg yolks are a pain to deal with and can cause smoothness problems in the ice cream later on. This is quite possibly one of the the smoothest, creamiest ice creams we have ever had anywhere, and it is absolutely the best ice cream we have made at home so far. 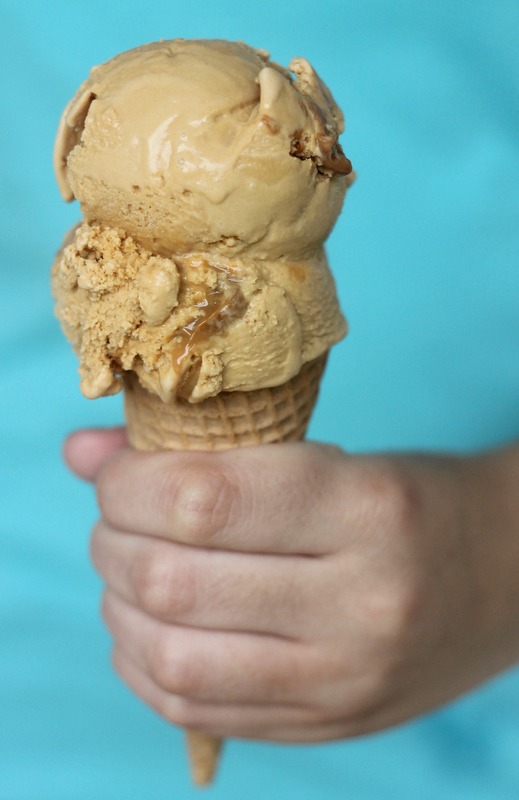 The dulce de leche flavor shines through, and it really could not be simpler to make. This ice cream is very rich, so a little bit goes a long way, which is a plus if you’re looking to serve a crowd. If you’ve never made ice cream before, this is a good way to start- there are only five ingredients that basically just have to be stirred together, so you really cannot go wrong! 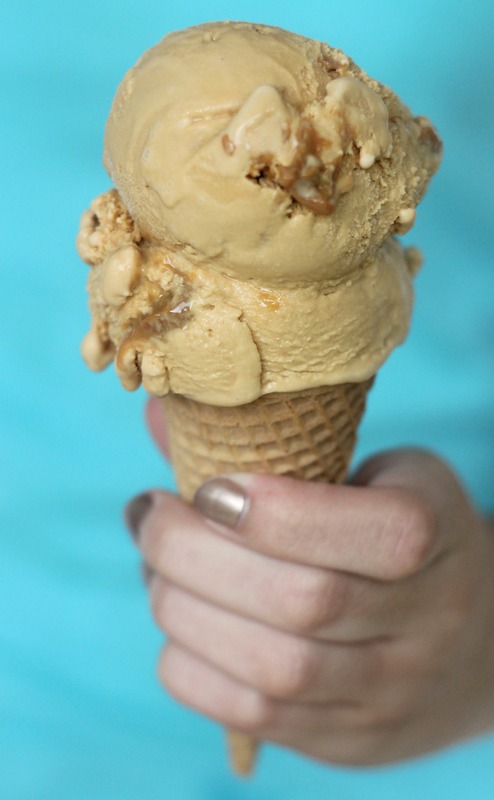 Side note: In our opinion, sugar and waffle cones are the way to go. Who wants a cardboard-tasting cake cone? Not us! Also, happy 4th of July tomorrow! Dulce de Leche Ice Cream Makes 1 quart (or enough to reasonably serve 8 people) Recipe from Confections of a Foodie Bride, originally adapted from Gourmet Ingredients 1 cup heavy cream 2 cups whole milk 2 cups dulce de leche, divided (you can make your own, but we didn’t- just use two cans and have a little leftover. Homemade dulce de leche can be dangerous to make-exploding cans are scary!) 1 tsp vanilla Scrapings from 1 vanilla bean Directions Heat together cream and milk until steaming in a pot. Remove from heat and stir in 1 2/3 cups dulce de leche, vanilla, and vanilla bean scrapings. Pour into a container and chill well. Once chilled, churn according to your ice cream maker’s directions. In a container, layer ice cream with remaining 1/3 cup dulce de leche, adding small spoonfuls of the dulce de leche between scoops of ice cream. Use a knife to slightly swirl the dulce de leche. Freeze for several hours (at least 4) until solid. Serve as desired- it’s delicious in a cone, but crumbled pretzels on top would probably be heavenly. Enjoy! Note: We usually make our ice cream base the night before, let it chill overnight, churn it in the ice cream machine in the morning, and let freeze in the freezer until solid so it’s ready at dinnertime. This ensures that everything is chilled properly. We also freeze the freezer bowls for 2 days to ensure that they are cold enough to properly churn the ice cream. I LOVE Dulce de Leche and can only imagine how delicious this ice cream must be! You would love this ice cream then! The dulce de leche flavor comes through really well.